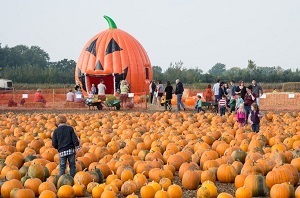 England: Northern East Anglia (Cambridgeshire, Norfolk, Suffolk) Pumpkin Patches, Corn Mazes, Hayrides and More - Find Halloween and Fall Fun! Looking for a local pumpkin patch, maize maze, hayride, gourds and other Halloween activities in England: Northern East Anglia (Cambridgeshire, Norfolk, Suffolk)? Scroll down this page and you will see the all of thoses in England: Northern East Anglia (Cambridgeshire, Norfolk, Suffolk), sorted by county. Some are farms, where you take a hay ride out into the field, others are elaborate farm stands with mountains of pumpkins and other activities and some are simple roadside stands. Most have loads of pumpkins to choose from. To really make it fun for your kids, look for those that have the extra activities, like a maize maze, spook house, or hayride. There is usually a small fee for the mazes (of course, the more elaborate mazes tend to charge more. Hayrides are often free. ALWAYS call before you go to confirm the info, they don't always report changes to me! Rectory Farm, Landbeach Road, Milton, Cambridge, CB24 6DA. Phone: 01223 860 374. Email: enquiries@themiltonmaizemaze.co.uk. Open: Friday in mid July through to Sunday in early September., closes at 6 pm. There is much more than a maze; why not try your hand at Mini Golf or a game of Skittles, other activities include a Giant Slide, Go Karts and Tractor & Trailer Rides. There is also a Farm Trail where you can meet the animals and even Feed the Fish! All of the attractions in the field of fun are included in the entrance price. The Old Dairy Café serves a range of food from filled baguettes, salads, jacket potatoes & Cream Teas along with a wide selection of drinks (Cooked breakfast during the maze is served from 9.30 a.m. – 11.15 a.m. Sundays 10 am – 11.15am). There is a BBQ Marquee serving local sausages and beef burgers. The Café closes at 5.pm You may bring your own picnic. However this may not be consumed in the Cafe Courtyard or near animal areas. Metton, Norfolk, NR11 8QU. Phone: 01263 761255. We offer a 12 acre Maize Maze and a large play area for all ages – you'll have plenty to do. Race around on the go karts or take our tractor train ride through the Maze. Swings, slides… let your little ones get wet with sponges whilst in the stocks. Large Jumping Pillow, Maize Maze, Toddlers Jumping Pillow, Big Pedal Carts, Small Pedal Carts, Straw Bale Mountain, Free Tractor Train Ride, Electric Quad Bikes (coin operated), Climbing Frame, Basket Swing, Springy Animals, Slide, Cubs Corner, Pedal Tractors, Farm animals including cows, sheep and chickens, Wet Sponge Stocks, Football, Covered Seating, Farm Cafe, Toilets/Disabled, Car Park. Make it a family day out, bring a picnic or enjoy the wonderful freshly cooked food from the Wizard Farm Café. Sip your tea and relax – knowing your children are safe in an enclosed play area, able to run free… To book a children's party, call Debbie on 01263 761255. Great Yarmouth Road, Hemsby, Norfolk NR29 4NL. Phone: 07771 605797. ALternate phone: 07974 658993. Email: info@hirstysfamilyfunpark.co.uk. Hirsty's is a real family fun day out. You'll have hours of fun wandering around our mega maze, meet the farmer and let him take you on a tractor and trailer ride around the farm, race your family and friends in our go-karts, speed down the zipwire and wind your way around our Crazy Croquet course with wellies. Click here for a link to our Facebook page. The White House - Pumpkins and many other PYO crops: Strawberries, Gooseberries, Raspberries, Blackcurrants, Redcurrants, Plums, Cherries, Apples, Pears, Potatoes, Courgettes, Onions, Beetroot, Sweetcorn, Tomatoes, Squashes. Blue Boar Lane, Sprowston, Norwich. Phone: 01603 419357. Email: thefarmer@norwich-pyo.co.uk. Open: June-October 9am to 5pm Tuesday to Sat, 10am to 4pm Sundays (closed Mondays). No dogs (we love dogs, but the fruit and vegetables have to be clean!). Debit and Credit cards accepted. We do Pumpkins! Giant ones that you can barely carry, right down to baby ones that small children can pick. They are all grown on the farm, and have to be chosen and picked by the families. If you're looking for a fun day out for all of the family, why not come and pick your own fruit and vegetables on the north east corner of Norwich. White House Farm is the perfect place to visit when you're looking to pick your own produce and experience the farm first hand. Our farm is set in beautiful countryside on the very edge of the city, and is easily accessible for everyone. We sell our own pork and other foods sold locally. Valley Farm, Sotterley, Beccles, Suffolk, NR34 7UH. Phone: 01502 476063. Alternate phone: 07934570235. Email: hundredriverfm@btconnect.com. Also Hereford beef, artisian ice cream and dairy products all from cattle on the farm. Relax in our picnic area and enjoy our delicious sandwiches and homemade cakes whilst your children play to their heart's content in the safety of our play area. The jumping pillow has been a real hit and there are pedal cars, tractors, a large sandpit and a climbing tower with slide and pedal go-karts for the older children. Just be sure to finish with one of our locally produced ice creams to complete your visit to the Southwold Maize Maze!